The year 2016 finds us in the middle of 4 years of reflection. One hundred years on, the horrors of the First World War is still a wound in the nation’s consciousness. We have found many ways to express this including of course through creative outlets. In 2014, I was privileged to be part of the Durham Creatives Always Remember, Never Forget collaborative exhibition at the Durham Light Infantry Museum Gallery. This started an interest for me as a writer in developing my work for exhibitions whether collaboratively or on my own such as Nissan: 30 Years On and Shades of Seville. 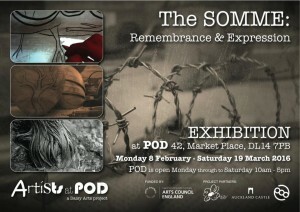 I was delighted therefore to be invited to take part in The Somme: Remembrance and Expression exhibition at Bishop Auckland’s Pod gallery, part of the town’s yearly Febfest. I thought long and hard about my exhibit and went to the Durham County Record Office (DRO) to research the archives on the Somme. With the help of a specialist on The Somme, I discovered that one of my favourite composers, George Butterworth, had actually died at the Battle of the Somme on 5th August 1916 aged 31 years and was an Officer of the 13th Battalion DLI. We can only wonder at what further beautiful music Butterworth would have gone on to write; he even burnt his unfinished scores before he left for war. One of the most moving experiences was to handle the actual daily log of the 13th Btn DLI. This was handwritten in copperplate script by the adjutant of the battalion. There I found the entry for 5th August 1916: 0445 Lt Butterworth killed. 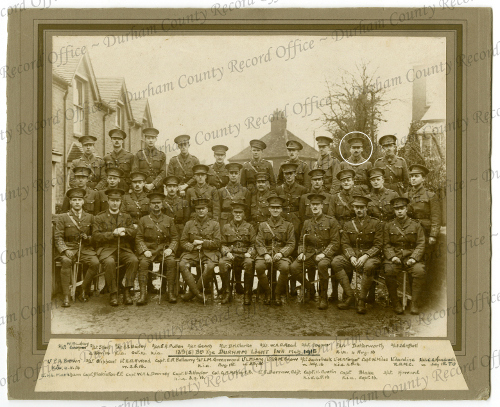 At the DRO, I also came across a photograph of the 31 Officers of the 13th Btn DLI arranged in 3 rows and taken in 1915. Underneath the image were the names of the men (including George Butterworth), their rank and whether wounded or killed during WW1. The research at DRO was to be my inspiration for a poem about George Butterworth and from this I developed my exhibit which was to include the photo of the officers and an audio soundscape. 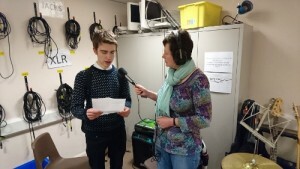 My poem was recorded by Tom Raine, a sixth former in Bishop Auckland and was set to evocative music by my daughter Rosie. This started with a refrain of Butterworth’s The Banks of the Green Willow and broke down into a discordant and microtonal tune – the imagined state of Butterworth’s mind as a reaction to his environment through music. 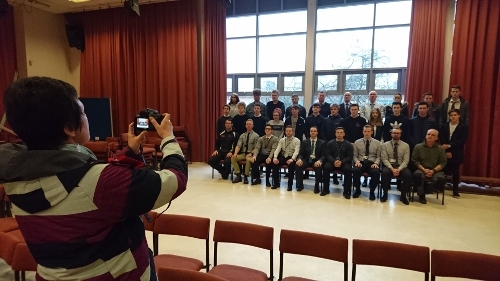 For some time it has been an ambition of mine to put the death of the Somme into a modern context and this I was able to do thanks to the pupils and staff of St John’s RC school and sixth form in Bishop Auckland. I transcribed the names of the Officers and their fate in WW1 underneath the photograph of 31 members of the school arranged in the same way as the Officers in the original 1915 photograph. The aim was to give a sense of what it would happen to people of army age if such a war was to happen today. 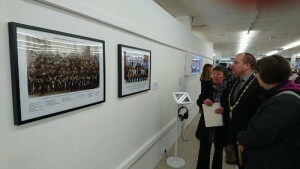 The exhibition was opened by the Mayor of Bishop Auckland on 8th February 2016 starting at the Town Hall where local schools have their work on display and then, led by a piper, everyone processed the Market Square to Pod where the young people showed such an interest in the professionals’ exhibition which was expressed through glass, painting, jewellery, textiles, woodturning, film, photography and audio. 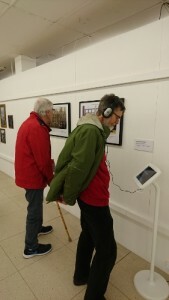 It was also a great delight to see people listening to my poem From English Idyll to Living Hell through the headphones at my listening post.